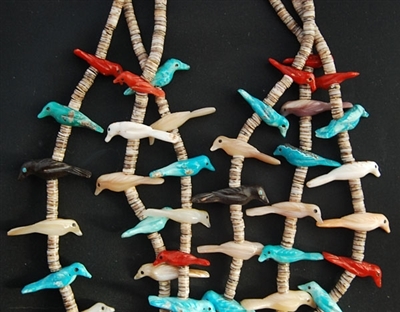 This lovely 3 strand necklace features 96 beautifully carved birds, by well-known Zuni carver Andrew Quam Sr. Circa: 1960's. 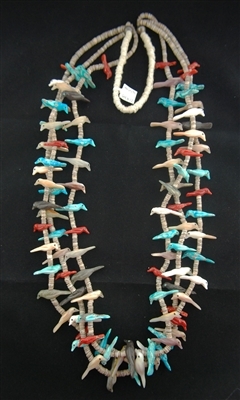 Beautiful sky blue turquoise, coral, jet and various shell makes this lovely, colorful necklace quite special. Traditional wrap at the neck. Andrew was a master Zuni fetish carver that was active for a short period into the 1970�s. 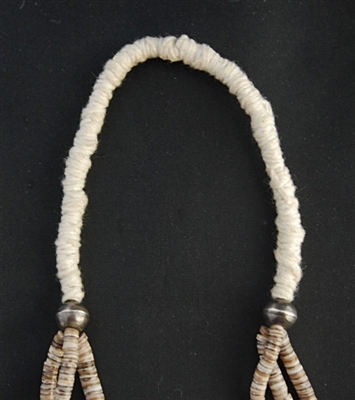 The necklace is strung with hand crafted Santa Domingo olive shell heshi. The total length is 31" long, with a 5" traditional wrap. The birds measure from 5/8" up to 1 1/8". with the average bird being 1" long. Just beautiful on!